Welded steel frames provide the necessary stiffness. 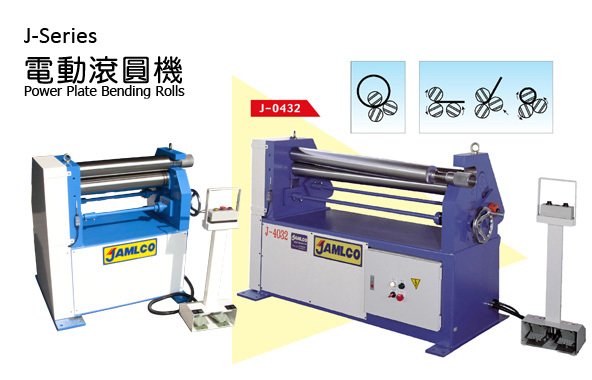 The design with three rolls mounted independently enables high productivity and easy adjustment of the rolls. All rolls are driven by a gear system in order to prevent scratches on easily damaged sheets from slipping rolls. Roll hardening ensures optimum service life, even in the case of intensive usage on steel or stainless. A polished finish prevents damage to prefinished parts, even parts in such highly sensitive materials. All transmission is built into one side. thus, it is easy to swing out the upper roll for workpiece removal. Copyright © 2014-2018 JAMLCO Enterprise Co., Ltd. All rights reserved.